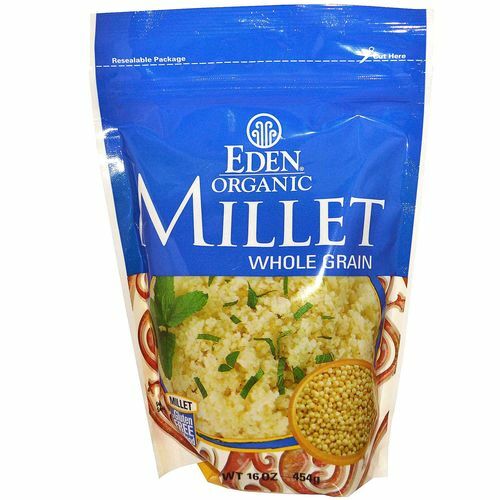 Maintain a healthy heart and help your body prevent certain types of with the help of Organic Millet by Eden Foods. Millet is an alkaline-producing grain with more than 6,000 species found throughout the world. Eden Food's Organic Millet comes from the Panicum miliaceum species of millet which is grown organically in the United States and milled to remove its hard inedible hull. Organic Millet is low in fat, contains no saturated fat or cholesterol and is a great source of fiber, protein, B vitamins and essential minerals. Great for breakfast, lunch or dinner, Organic Millet by Eden Foods is a delicious and nutritious grain the whole family is sure to love. Order a package today and pay less! Notas: Contains no saturated fat, wheat or gluten. Certified kosher, pareve, organic and non-GMO verified. Recomendações de uso: Wash in cold water and place 1 cup millet in a pan with 3 cups of water. Cover, bring to a boil, reduce heat and simmer for 30 minutes. Fluff to cool for salads. Try one of these great recipes from Eden Foods!